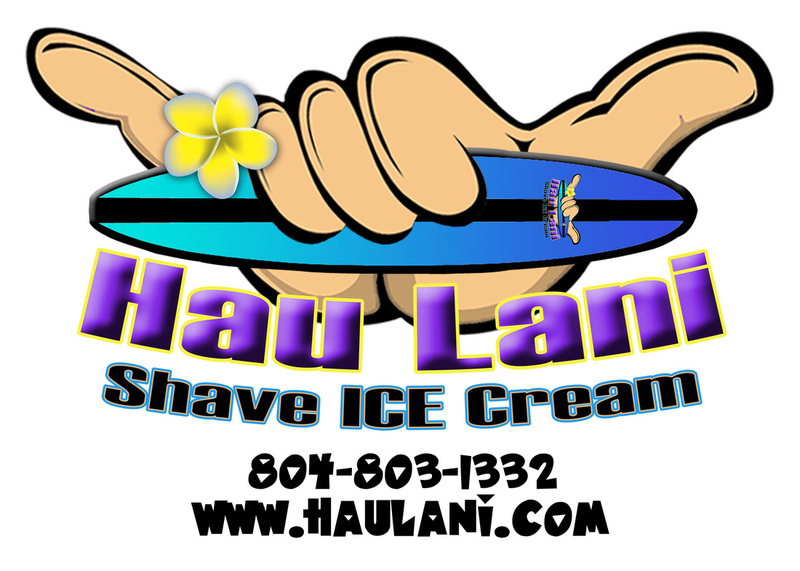 Welcome to Hau Lani Shave Ice Cream where you will experience the sights, sounds and especially tastes of Hawaii! "Hau Lani" is Hawaiian for "Heavenly Ice" and that's exactly what you'll find when you visit Hau Lani Shave Ice Cream! "Heavenly Ice" comes in many delicious flavors and can be topped off with a number of add-ons to include marshnallow or sweet cream, sour spray, or traditional Hawaiian azuki beans! We are a mobile unit that comes to your events! We attend county fairs, festivals, farmers' markets, sporting events, grand openings, fundraisers, birthday parties, etc. Please use our Contact page to receive more info. Also, be sure to check our "Scheduled Events" page for availability..
Order your Hau Lani gear here! Clicking on the link above will take you to Cafe Press.com where you can purchase all sorts of cool Hau Lani trademark items! "Hawaiian Shave Ice" is ice that has been shaven to the consistency of powdery snow and then flavored with a variety of decadent syrups. Hau Lani Shave Ice Cream has lots of individual flavors and hundreds of flavor combinations. ​Our gourmet flavors will have your taste buds exploding with delight! For a truly AUTHENTIC Hawaiian delight, start with a scoop of our premium vanilla ice cream, add our mouth-watering, finely-shaven ice, top it all with your favorite shave ice flavor, or two, and finish it off with sweet cream, marshmallow or azuki beans and your taste buds are in for the treat of their lives! You've never experienced anything like it before!! Our Super Premium Ice Cream is created from the world's finest ingredients. What is "Super Premium" Ice Cream? It's smooth, rich and succulent filled with only the freshest ingredients! !